The 6th Annual Tres Pescados Slam Tournament saw the participation of 21 teams of talented anglers, but at the end of the three-day fishing tournament, it was team Yellow Dog who took the grand prize. The tournament commenced on Thursday, July 24th and ended on Saturday, July 26th with a grand award banquet for the participants at Caprice Restaurant and Bar. 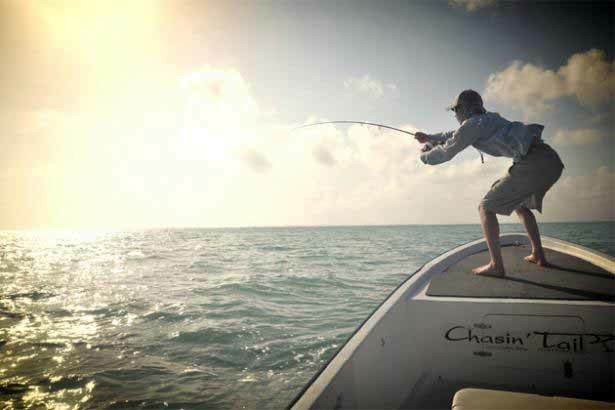 The tournament is catch and release, and is aimed at the promotion of the importance of three fish species to the economy of Ambergris Caye, the Tarpon, Bonefish and Permit. The team’s catch was recorded through video or photo proof, and points were awarded according to the size and species of the fish caught. Team Yellow Dog with anglers Doug McKnight and Shawn Lawsontook the lead from the first day when they racked up 1,225 points. In second place with 375 points were both AM Films with angler Adam Marton, and Tarpon Maniacs with anglers Raul Castaneda and Alejandro Vega. Third place was shared by three teams, all with 300 points:Bush Remedy with anglers Justin Parrish and Stuart Dole, Big E with angler Eric Wasserman, and Peninsula Fly Club with anglers Marco Ruz and Nassim Joaquin. AM Films racked up 1275 points on the final day, and they walked away with the second prize in the whole tournament, winning $3,000 among other prizes and a trophy. Tarpon Maniacs racked up 1125 points on day three, and they walked away with third place’s $2,000 and a trophy. All prizes were presented during the award banquet held on the final night of the tournament. Individual awards were also given out. The Female Angler Award went toCourtney Marie Martin from BelizeflyGyalz, while Daniel Smith from Belize Young Guns took the Junior Angler Award. The final award was given to Belize Young Guns’ Michael Guerrero for being tournament’s the newest angler. Over $12,000 was raised for the Carlos Marin Foundation, and the funds will be used to benefit the protection of the fly fish species in Belize. - Press Release - The 6th Annual Tres Pescados Slam Tournament was a huge success thanks to all the anglers and sponsors that participated in Belize's largest ever fly-fishing tournament. Hats off to Team Yellow Dog Flyfishing for not only slamming on the first day but, holding their ground on day two and three to bring home first place and the coveted slam trophy. Day one saw beautiful weather and wind from the East as teams rallied early to make the most of the conditions. All three species were caught the first day, with Team YELLOW DOG capturing the first slam of the contest and gaining those valuable bonus points. A three way tie for second and two teams tied for third place was sure to make day two interesting. The second morning brought similar weather conditions and teams pushed early on to catch the all important slam. Both permit and tarpon saw the scoreboard as well as numerous bonefish. 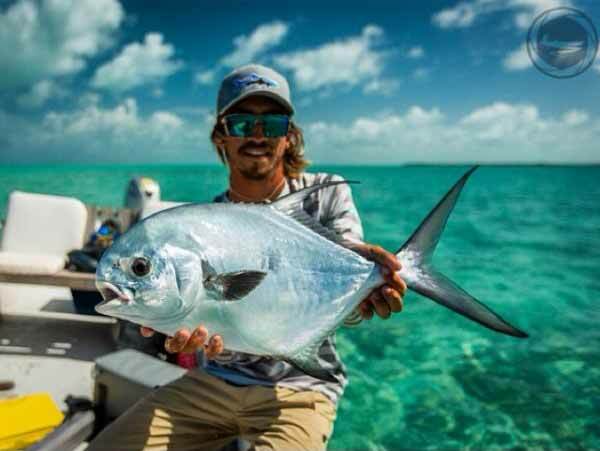 Team AM FILMS closed the gap on leaders YELLOW DOG with three permit landed and needed only the tarpon on the final day to make things interesting. Final morning brought some early rain showers and cloudy skies making the fishing difficult and frustrating. Leader board at the top had YELLOW DOG in the lead, trailed closely by AM FILMS in second and TARPON MANIACS rounding out the top three. Tide played a huge factor during the final day as water was held off the flats by the north wind. In the end Team YD prevailed and was crowned the 2014 Grand Champions. Huge thanks to everyone involved in making this an historic event. Come join us next year for the 2015 Tres Pescados Slam Tournament July 9 - 11th in beautiful San Pedro, Belize. Top 3 teams took home hand carved pendants made by Capt Robby along with 1st & 2nd place receiving two tickets each from Tropic Air. Each of their guides was awarded with a brand new pair of Costa Sunglasses. New Angler Award - Michael Guerrero - BZ Young Guns The top female, top junior and new angler were all awarded with a brand new Hatch Reel, Scott Fly Rod (new Tidal Series) and pendants hand carved by Capt Robby.